The fate of the Kakaako CompUSA store on Ala Moana Boulevard is still unknown, but according to the general manager, the store is a top seller for the company. CompUSA customers and employees got a shock to the system yesterday when the retailer said it is being sold to a Boston company that intends to shut down most of its stores. But a ray of hope emerged for the chain's two Hawaii stores as the companies said they are in talks to sell, rather than close, stores in unspecified "key markets." Honolulu's store is the top-selling outlet in the chain, according to its general manager, Ken Elton. "I don't anticipate the stores in Hawaii will be closing," he said yesterday. CompUSA announced yesterday it has been acquired by an affiliate of Gordon Brothers Group LLC, a global advisory, restructuring and investment firm based in Boston that intends to shut down most of the chain's stores. Hawaii is home to two CompUSA superstores -- one on Ala Moana Boulevard in Kakaako and one at the Pearl Highlands Center in Pearl City. Ken Elton, Kakaako CompUSA's general manager, said he had not heard anything official from corporate headquarters about the fate of the company's two Hawaii stores, but he said there was no indication that the stores would be closing. A statement yesterday from the companies said active discussions are under way to sell select stores in unspecified "key markets" as well as the company's technical services arm, CompUSA TechPro and Internet sales operation, CompUSA.com. "Honolulu is the No. 1 store in the company," Elton said. "We've been profitable and we've never not been profitable. I don't anticipate the stores in Hawaii will be closing." Elton added that if the stores will not be closing, then there will not likely be a closing blowout sale for the stores in Hawaii, but that CompUSA would continue its regular holiday schedule. "We ask customers to be patient with us, and we'll get things taken care of," he said. The Dallas-based consumer electronics retailer said yesterday it would close most store operations after the holidays. Financial terms of the sale were not disclosed. Gordon Brothers Group, which assisted CompUSA with the prior sale of underperforming stores, will initiate an "orderly wind-down" of CompUSA's retail store operations, according to the statement from the companies. Gordon's newly created affiliate, Specialty Equity LLC, will handle the deal. Honolulu retail analyst Stephany Sofos said the acquisition comes as no surprise. CompUSA, formerly a pure computer retail store, began expanding into other areas, offering televisions, accessories, phones and digital cameras. This put them in direct competition with Costco Wholesale Corp. and Best Buy. "Competition was getting thicker and thicker," Sofos said. "When you sell your best stores, then you can rebuild your business plan and then maybe go back to your core business without the overhead." CompUSA, privately held and controlled by Mexican financier Carlos Slim Helu's Grupo Carso SA, currently has 103 U.S. retail stores, all of which are expected to remain open and staffed during the holiday season. Due to foundering computer sales, CompUSA reduced its store count by more than half back in March, shuttering 126 stores, including all four in Minnesota, in exchange for a $440 million cash infusion. 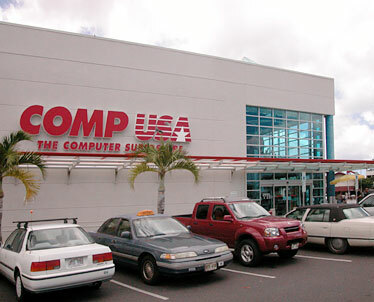 The first CompUSA opened to plenty of hype at the Kakaako location, measuring 40,000 square feet, back in June 1998. With its entrance, the company also acquired its prime competitor, Computer City, owned by the Tandy Corp., which closed its store in Kakaako later. Last year, CompUSA also relocated its Waikele Shopping Center outlet to a 20,000-square-foot spot at Pearl Highlands to offer an expanded selection of home electronics. Sofos said she thinks CompUSA was likely doing fine here and that many potential buyers interested in entering the Hawaii market would be interested at the prospect of buying their two stores, which are large and in prime real estate locations. Target Corp., for instance, would be a prime example, she said. DJM Realty, a Gordon Brothers Group affiliate, will assess the leases for CompUSA's store locations. Numerous blogs and chats have already sprung up on the Web -- with speculations on the bargains to be found at CompUSA's closeout sales over the holidays. On Thanksgiving, CompUSA opened its doors from 9 p.m. to midnight, and then at 5 a.m. on Black Friday. Under the new merger, CompUSA will be run by Bill Weinstein, a principal at Gordon Brothers Group, who will act as interim president, and by Stephen Gray, managing partner at restructuring firm CRG Partners, who will serve as chief restructuring officer. "An orderly and expedited wind-down and asset sale process is the best option for CompUSA and its creditors at this juncture," Weinstein said. "We are focused on assuring that CompUSA's creditors, landlords and other key constituents are treated properly during this process. We are working hard to achieve the maximum recovery possible for the company's constituents while also minimizing unnecessary expenses. We will actively communicate with the various parties and their advisers starting today, and in the days and weeks ahead." Current CompUSA CEO Roman Ross will continue to serve the company in an executive advisory capacity during the transition period.